ALEKO 6 ft. x 25 ft. fence privacy screen is ideal for commercial and residential fences needing a combination of privacy, air flow. This privacy screen is the most economical solution to provide the privacy you need and a clean look for any fence area, construction site, special event, back yard, or fence barrier, and is a perfect complement to landscapes and residential backyards. 25' long x 6' tall - fits perfect on 6' tall fence, 150 grams per square meter. Double grommets on every corner edge for extra strength. Perfect for home, court, pool, garden yard or construction. 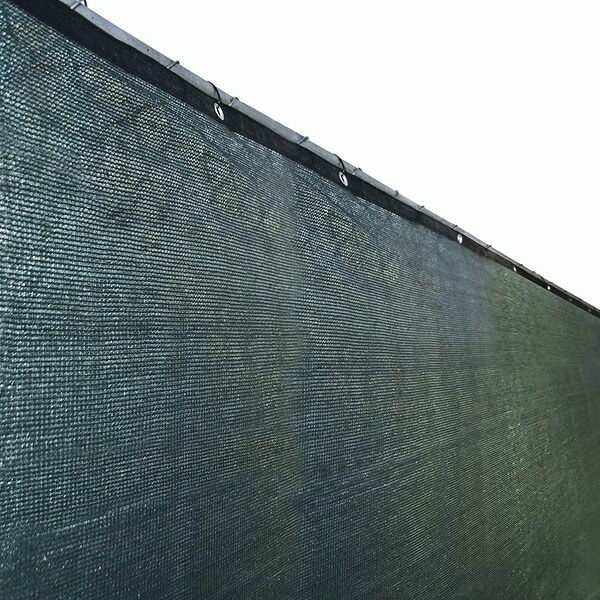 Visibility blockage: 88%-90% high quality polyethylene knitted design privacy screen. It's UV resistant, tape and aluminum rust free grommets placed evenly on all 4 sides, zip ties included. Dimensions 300.0 In. X 72.0 In. Excellent for covering my ugly chain link fence. Transformed my backyard. When a storm hit and a tree fell on my chain link fence. I did my best in trying to repair it buy it was still was an eyesore. This screen covered imperfections and gave uniformity to create a new backdrop that looks nice.